Back in May, I was fortunate to attend the Stir Trek conference in Columbus OH (it sold out in under a minute). There were a lot of great presentations, but one that really stood out for me was one on Sonic Pi. Scott Fradkin live-coded Sonic Pi for nearly an hour, not only explaining what it was capable of, but showing us too. He kept building it up as the session went on, and everyone in the theatre had a chance to see and hear what he was creating. 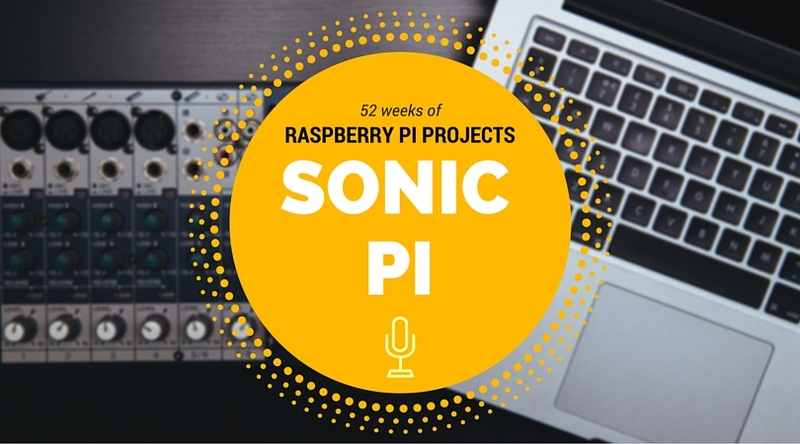 Sonic Pi is an environment that lets you actually program sounds and create music. You can learn about music and coding at the same time, and it’s entirely free too! Sonic Pi encourages you to learn about both computing and music through play and experimentation. The most important thing is that you’re having fun, and before you know it you’ll have accidentally learned how to code, compose and perform. If you want a minimal amount of fuss, do your work directly on the Pi. The Jessie version of Raspbian comes preinstalled with Sonic Pi, so you don’t need to do anything else. However, even though “Pi” is in its name, you can run Sonic Pi on Mac, Windows, different *nix environments and more, so you can create music without being on the Raspberry Pi. Sam has helpfully provided builds for all the major OS’s. I didn’t want to develop everything on the Pi itself (slower, smaller screen size, etc), so I used the Mac OS X installer, which went smoothly. When you start Sonic Pi for the first time, it opens a tutorial in the lower-left corner. I’d highly recommend following the first section, “Welcome to Sonic Pi”, and probably the second section too, “Synths”. Here’s the equivalent of “Hello World” in Sonic Pi, taken from the tutorial. It just plays a steady beat like a metronome, in an infinite loop until you stop it. 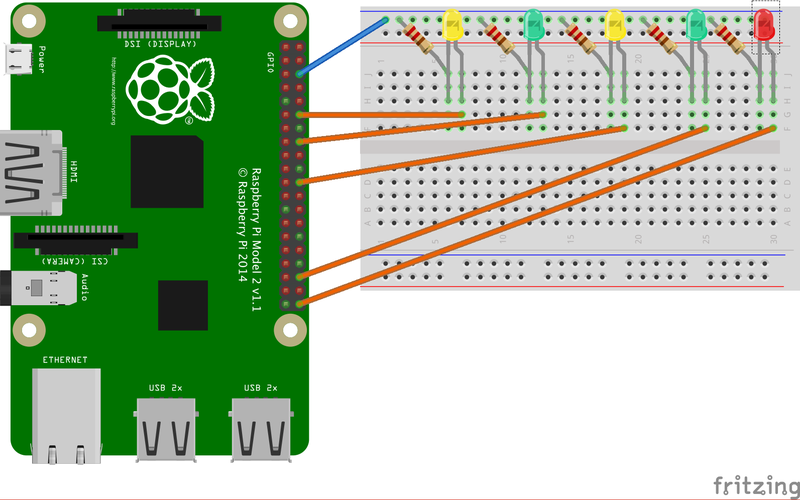 Assuming you’ve got Sonic Pi installed, and it’s working correctly, there’s another technology we need to cover briefly too. Sonic Pi can record the music you create, allowing you to save it as a wav file. So we could just create some wav files and play them from our Python code. But where’s the fun in that? If we want to change individual notes, we have to record the entire clip again, and that’s just tedious. I wanted something more dynamic, a way to communicate with Sonic Pi from within the code and send it notes to play. And that way is called OSC. There’s a lot more on that page about it, but all you need to know for now is that it’s a protocol, and we can use it to communicate with Sonic Pi. Sonic Pi was designed with OSC in mind, and is configured to listen for OSC messages on localhost port 4557, so that’s where we need to send our messages. Lucky for us, we don’t need to reinvent the wheel. Nick Johnstone created a ruby gem called sonic-pi-cli, which allows us to send messages via the command line. ERROR: Sonic Pi is not listening on 4557 – is it running? Assuming that worked, we still need to find a way to communicate with Sonic Pi from Python. There are packages written for Python that do just that, including python-osc, pyOSC and pyliblo, but we’re just going to build on top of what we’ve already got. Raspbian has Ruby and Python installed by default, so we can just run commands from Python, to be intercepted by the Ruby gem, and forwarded on to Sonic Pi. Either place the following two lines in a script and run them, or type “python” in the terminal to open the python shell and paste them in one at a time. The idea for this project started when I was reading through the Sonic Pi tutorial, and somehow found myself on the wikipedia page for the Westminster Quarters. That’s a melody used by some churches, grandfather clocks, Big Ben, etc., on each quarter hour. I figured it might make a fun project that tied in the Pi, Python and Sonic Pi, in a unique way. I had to do *something *with LEDs because… reasons. Visual feedback is nice. First, here’s the circuit I designed. It’s really basic, just connecting a series of LEDs to board pins 12, 16, 22, 36 and 40, which can be turned on or off in sequence with the notes being played. Make sure Sonic Pi is running, and then check out and run the script, or just copy the code below. Note: You may want to adjust the minutes in the monitor function. Change “00” to whatever the current minute is, so you can see feedback immediately when you run the script. Or just wait until the nearest quarter-hour! Here’s a 12-minute video of me talking a bit about it, and showing it in action. If you want to check out what Scott did at Stir Trek, you can find it on GitHub account. My @stirtrek presentation and @Sonic_Pi files can be found at https://t.co/Yeug2TW2cx. Enjoy! Also, the Stir Trek organizers recorded the sessions this year, and you can watch his below. If you’re interested in learning more, here are some links to Sonic Pi (and related) resources. I also tried Ubuntu 16.04 but ran into multiple startup issues and problems with sound not working (in Sonic Pi only). Debian Jessie is an involved setup that I didn’t feel like doing, but Debian Stretch (its successor, still under development) should allow for a simple one-line install from the command line. Questions? Comments? Feel free to leave a message below!